Paddy Lowe, Chief Technical Officer: It’s great to be back at Interlagos. The cars come around very quickly due to this being a short circuit, meaning life on the pitwall and in the garage is quite intense. We had a lot of problems with traffic today and both drivers struggled to get a fully clear lap when on their one lap pace runs. Nevertheless, we managed to complete our programme without any issues. We’ve tested all three compounds thoroughly, both at low and high fuel. There’s certainly opportunity to compete here. A very close grid means half a tenth can make a significant difference. We will be working very hard tomorrow to see if we can translate that into some good grid positions and a strong race. 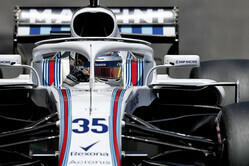 Lance Stroll: It was the usual Friday, just learning as we are running. It is great to be back in Brazil on this track. I think we made some good steps with the car today and it felt ok. We will see what tomorrow brings and where we are compared to the rest of the field. Perhaps we can get into Q2, and I hope that will be the case, but we will see after FP3 when we will have a much better idea. In qualifying it is a short lap here, so it is about piecing it together and getting the most out of it. it is going to be very tight in that midfield, so it is about every hundredth and every thousandth, which means it should be exciting. Sergey Sirotkin: It was a busy day today, we had some interesting bits on the car for next year’s development. We managed to collect a lot of data and went right back to the baseline. We then had to switch back to race weekend preparations and car set-up which went fine. In these conditions I think we are reasonably good. There are a few bits I could have done better on my lap but I think pace looks good, particularly long pace, which was surprisingly good. Overall busy, but a good day. Next Next post: NASCAR makes offer to purchase International Speedway Corp.